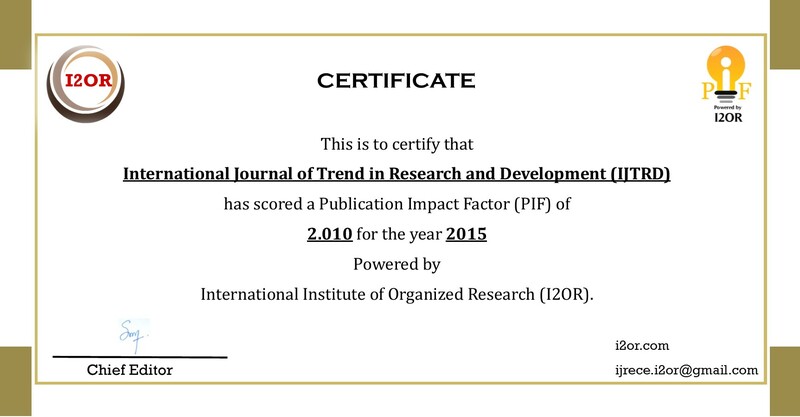 Impact Factor of IJTRD journal for year 2015 is 2.010 Calculated by I2oR. Click Here for Details. Impact Factor of IJTRD journal for year 2016 is 3.025 Calculated by I2oR. Click Here for Details. Impact Factor of IJTRD journal for year 2017 is 4.004 Calculated by I2oR. Click Here for Details. 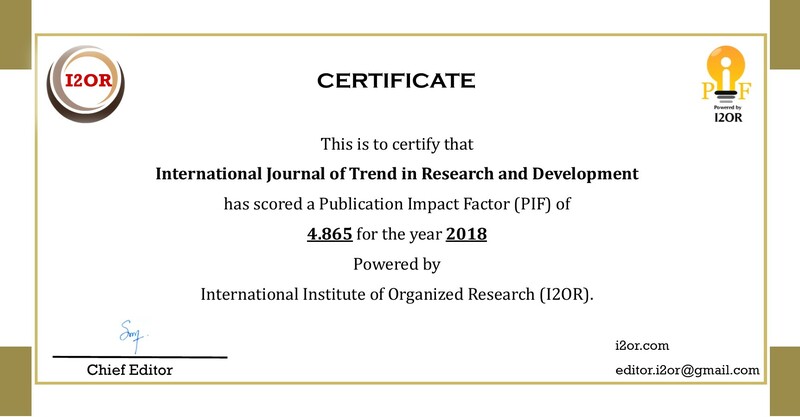 Impact Factor of IJTRD journal for year 2018 is 4.865 Calculated by I2oR. Click Here for Details. Authors are requested to note that submitted manuscripts may be subject to checks using the iThenticate service, in conjunction with CrossCheck, in order to detect instances of overlapping and similar text. The iThenticate software checks submissions against millions of published research papers, documents on the web, and other relevant sources. If plagiarism or misconduct is found, consequences are detailed in the policy. The chief goal of our policy is threefold: to provide advice for our authors, to maintain the scholarly integrity of our journals and their content, and to detail the ethical responsibilities of IJTRD Journal, our editors and authors. We expect all authors to read and understand our ethics policy before paper submitting to our journals. This is in accordance with our commitment to the prevention of ethical misconduct, which we recognize to be a growing problem in academic and professional publications. It is important to note that most incidents of plagiarism, redundant publication, copyright infringement or similar occur because of a lack of understanding, and not through fraudulent intent. Our policy is one of prevention and not persecution. The journal employs the double-blind peer review process, where both reviewers and authors remain anonymous throughout the review process. Every proposal submitted for publication is read at least by an editor, for an initial review. If the paper agrees with editorial policies and with a minimum quality level, is sent to two reviewers. The reviewers won't know the author's identity, as any identifying information will be stripped from the document before review. IJTRD part of CrossCheck, an initiative to help editors verify the originality of submitted manuscripts. As part of this process, selected submitted manuscripts are scanned and compared with the CrossCheck database. Plagiarism is when an author attempts to pass off someone else’s work as his or her own. Duplicate publication, sometimes called self-plagiarism, occurs when an author reuses substantial parts of his or her own published work without providing the appropriate references. This can range from getting an identical paper published in multiple journals, to ‘salami-slicing’, where authors add small amounts of new data to a previous paper. IJTRD will judge any case of plagiarism on its limits. If plagiarism is detected by the editorial board member, reviewer, editor etc., in any stage of article process- before or after acceptance then we will alert the same to the author(s) and will ask them to rewrite the content or the to cite the references from where the content has been taken. If more than 30% of the paper is plagiarized- the article may be rejected and the same is notified to the author. All the submitted manuscripts for publication are checked for plagiarism after submission and before starting review.